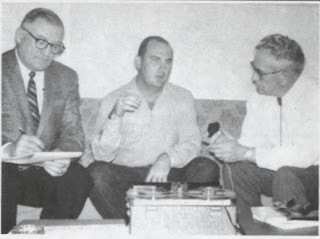 Watts being interviewed in 1968 by UFO investigators. 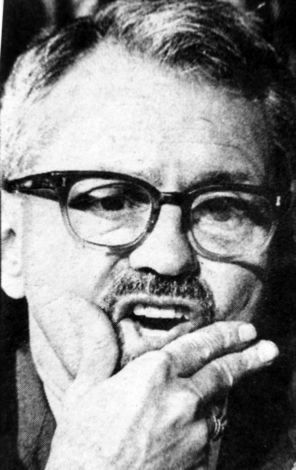 Carroll Wayne Watts said he had a close encounter with a UFO the night of March 31, 1967, but it was not reported until the following day, on April 1. 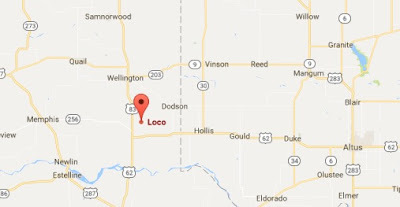 Watts lived in the tiny town of Loco, in the Texas Panhandle, just south of Wellington, about 100 miles east of Amarillo. His story was carried in United Press International news service, UPI, and published March 2, as reprinted below. Loco, Texas, near the Oklahoma border. A Wellington farmer said today that he spoke to a flying saucer last night. The man, Carroll Watts, said he was returning home from his father`s residence about a mile north of his home at about 10:30 Friday night when he saw a light from about where an abandoned house stands. "I walked around the side of it, and about 20 feet down the side l Found a port or door. l knocked on it three or four times and it opened mechanically,” he said. ”A VOICE began speaking to me- it was an unemotional voice neither masculine nor feminine. lt asked me if I would be willing to submit lo a rigorous physical examination. “I asked them why I would want to take a physical and they told me that if I passed it, l would be able to make a flight with them. They said any man who passed the physical could make a flight, but no women or children would be taken. “Then they informed me that they had a machine that, when the ship within 300 yards of a building, could tell how many people were in the building and their ages. "They (the voice) then asked me again to take the physical--and when l declined, they told me that several people had taken the test and had made the flights. “They, whoever they were, said they were stationed all over the world and could come and go as they pleased-no one could stop them. “l told them l didn’t want to take that physical and I got back in my car and turned the lights on the ship. “As I pulled in front of it, it rose slightly and turned to the south. There was a light, about 20 inches across, on the of the nose. As the ship was sitting, it gave off a clear fluorescent light, but when the ship began to move, the light took on a reddish cast. 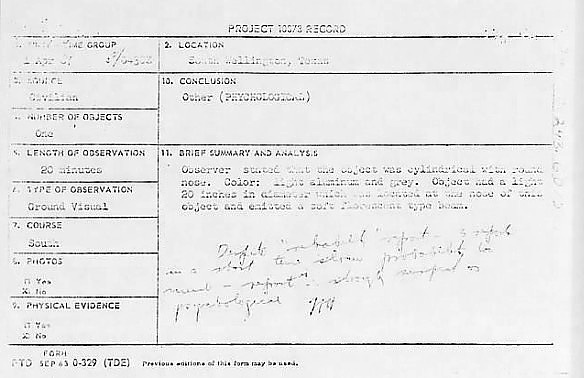 Project Blue Book file card "Psychological"
As he spoke to UPI by telephone, Watts had two Air Force investigators at his home. The investigators were sent to Wellington from Altus Air Force Base. Okla. The incident is the third reported in the Wellington area in the last month. On March 21, Watts reported sighting such a craft flying at about 50 miles an hour over a road for about eight miles. 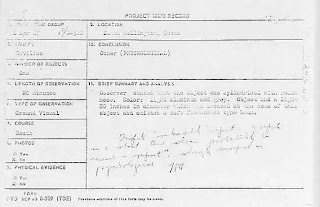 On March 23 an Air Force man reported that he was chased along a road by a similar craft for some time. "If this is a hoax, it is a very, very clever one. In fact, it would be such a clever hoax that it would be almost as interesting as what this farmer claims has happened to him." More on Watts' incredible saga to come.